I have decided that on my creating journey, I will document my work using a blog. I have always loved writing since I was quite young, and over the years, I have experimented with a few types of blogs. Here I will be telling you about my designs and creations, showing you how you can use my pieces from my online store to create your own costumes and put-together looks, and more. I have always loved fashion, costume, dressing up, and creating things, so culminating this all together in one arena has me so excited for the future. I love to make people feel special, beautiful, and transported to another place and time through the use of wearable art. It is why I do what I do and chose to pursue this career. Once I got out of design school and started my own brand, I quickly found that making ready-to-wear clothing wasn’t what I really wanted to do, nor was it well suited for me personally. I love to create extensive detail oriented things and focus not on it’s ‘wearability’, but rather on its ability to tell a story and create a fantasy. I have also always been invested in fantasy literature, graphic novels, video games, film, history, and mythology as inspiration, reference material, and just things I generally love. While I was in school, I didn’t feel I had much time to explore these other loves in my life, so I chose to focus solely on getting my degree in fashion design. Thus, I never really realized there was an avenue and a niche for people that love the things I love, but also love dressing up and fashion. Going to some of the first conventions I went to and researching cosplay and costume design was so eye opening and startling for me. This is where I am supposed to be! It took a while for me to gain the confidence and realization that I could in fact pursue this, so here we are today. I’ve made costumes and headpieces/jewelry for myself for years, but have kept it pretty private and under the radar strictly in my personal life. Places like the Renaissance Faire and conventions were the only time these pieces came out. Now, I am showing it all to you and making it the re-invention of my brand. 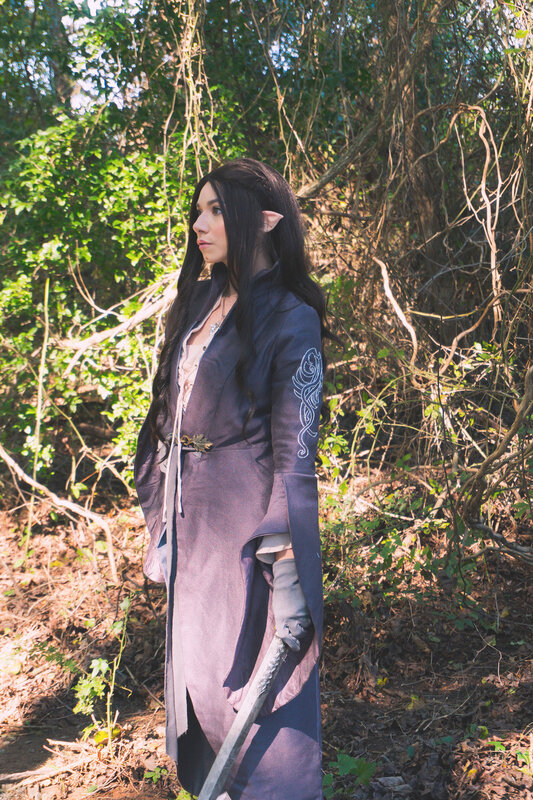 I am so thrilled that the first creation I am showing you all in this area is my Arwen Riding Outfit from LOTR- Fellowship of the Ring. Arwen is a beloved character of mine from books and film. Her grace and beauty is astonishing, not to mention her courage in the face of making a decision to follow her heart and not the lineage of her people. There are discrepancies between the books and films as to how Arwen is portrayed, particularly in the scene I chose to make this outfit from. In the books, it is Glorfindel who saves Frodo from the Nazgul, while the movies chose to have Arwen be the one who takes Frodo to Rivendell. Though some criticize this creative liberty, I believe it was a great way to introduce Arwen into the movie and show the significance of her character to Aragorn in particular and as well to the storyline. In this scene she wears a riding coat ensemble with beautiful embroidered sleeves which is convenient for horse riding and hobbit saving, while also seems fit for the daughter of Elrond. Though the discrepancies exist in the movies, it is an incredible scene in the films, very action packed and a wonderful introduction to the Arwen character. For this cosplay, I focused on the shape and details of the coat to be as similar to the movie costume as I felt was appropriate. Because the movie came out over 15 years ago, the details of her underclothes and other things are hard to find. There are some online resources I used to find the appropriate shape for the sleeve embroidery as well. My background and degree in clothing design means that I am fairly well-versed in pattern drafting for clothing, and that was what I did for the main frame of the coat. In the movies, the coat is more of a gray color, but I had a few of these gorgeous purple-gray fabrics in my studio that I only had enough left of to make one thing, and I thought this color choice was flattering on me as well as being close to the movie fabric color. The gray fabrics that I had in my studio were definitely not the right weight or drape for a coat like this, and those are some of the decisions that will make or break a piece of clothing. The main fabric is a medium weight woven silk with a pretty kind of marled texture, and then I have a lighter sparkly gray stretch fabric for the lining and the crinkled silk for the collar, sleeves, and back detail. This crinkled silk looks very similar to the details in the coat in the film, so I was very happy that worked out. I started drafting a basic princess-seam coat pattern, and adjusted the bottom coat sections, sleeves, and collar to be accurate to the general look of the movie costume. The way the costume designers in the film created the wardrobe for all of the Elven characters follows a fairly similar formula. It is always graceful, long lines, draped shapes that follow a sort of kimono look, and the details are more or less in embroidery and beading. I love this aesthetic as I love Elf-lore in general as elves are typically depicted as graceful, ethereal creatures. This look fits that bill perfectly. So I followed this aesthetic when creating my patterns, though I needed to make sure it suited my more petite frame. I am so happy with how it came out, and I think it is incredibly reminiscent of the exact wardrobe from the film. I found a close up photo of the sleeve embroidery from the film and copied it as best as I could. I mirrored the design on both sides and hand embroidered it with silver embroidery thread. I genuinely love doing hand embroidery; you feel so accomplished when you get it done, but it is rather time consuming! My wig was purchased from a local beauty supply shop here in Charlotte. I wanted it to look graceful, thick and be incredibly long and I think this wig turned out to be the perfect choice. I saw a few online that looked okay, but I really enjoy being able to go to a shop and see it in person first. Particularly because this hair needed to look natural and graceful, I loved that I was able to find one and pick it out in person. I ordered my Evenstar necklace online, but the chain that came with the necklace was quite long, so I used a shorter chain that I already had. Arwen’s silver belt detail piece was difficult to replicate. I tried making it with porcelain clay and painting it silver, but I believe I would have done better with polymer clay in this case. Details did not hold as I hoped and I couldn’t seem to get it thin enough to look graceful, but thick enough to hold it’s shape. Clay isn’t something I am well versed in yet, but I am doing more clay work in the coming months, so I feel I’ll expand my skillset enough to make this eventually. I chose to use a silver leaf clip I have from an Etsy shop, which I think worked out well and made my costume unique. I did wear purple contacts for this cosplay as well, though because I have to have prescription lenses, I don’t think the color made that much of a difference to my normal eye color which is an amber brown. However, particularly in the close up shots you can see the purple color in my eyes which is nice! I think the makeup was actually the hardest part of the look as it needs to look super natural and like I don’t have any makeup on at all. I think I accomplished this pretty well, although for photos especially I needed some definition in my eyes. When I wore the look to Dragon Con (which I made it for), I definitely got away with less makeup. I focused on a clean foundation application, some contouring, natural eye colors and a rosey lip. My ears are from Aradani costumes, and I think they worked out well. Arwen’s ears in the films are quite delicately pointed, and finding prosthetic ones that fit that bill is actually a bit difficult. All in all I think I am very happy with how this costume turned out! I absolutely loved working on it and I am so excited to create more and more elven wares and costumes! My plan is for my online store to have elven inspired pieces of my own design that you can use to create whatever look you desire! 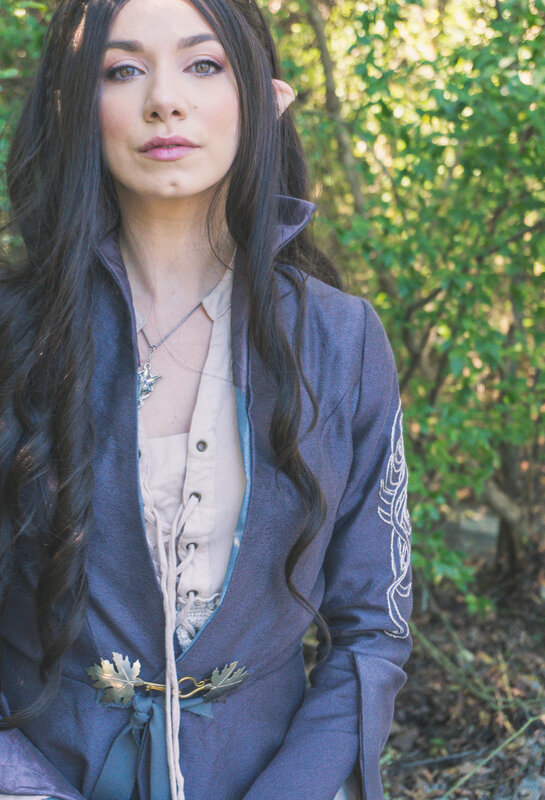 What do you think of my Arwen costume? If you could cosplay a character or have cosplayed a character from Lord of the Rings, Who would you choose?